Margarita Sandoval Skare and Alberto Cardenas perform with Grupo Renacer at Los Mariachis Restaurant in Milwaukee. Margarita Sandoval Skare fondly remembers the mariachi music of her youth. Her father, who moved along with some of the first Mexican families to Milwaukee in 1924, became well known in the Mexican community as a musician who played guitar with the José Martinez Orquesta and Bill Carlson Big Band. “Growing up in a Mexican family I listened to albums from various Mexican trios and to this day have the 33⅓ long-playing albums with the beautiful covers of the various trios and folkloric dancers in beautiful costumes,” says Skare, who often sang with her sisters as her father played guitar at parties and community events. Skare, a recently retired Milwaukee Public School teacher and librarian, decided to reconnect with the mariachi tradition. But it wasn’t enough for her to just listen to the music; Skare wanted to learn how to play it herself. She hoped to make that connection through Alberto Cardenas, a professional mariachi musician she met during a performance at her daughter Stefanie’s wedding in 2004. Born into a musical family, Cardenas began teaching himself mariachi music at age eleven when his uncle gave him a guitar. Today he is a master musician and founder of Trio Alma Latina and Voces y Cuerdas de Mexico, two of the most well-known mariachi groups in Wisconsin. “For me, mariachi music means joy and courage to face life, from birth through death,” says Cardenas. Drawing on indigenous instrumentation as well as French and Spanish colonial influences, mariachi became a way of chronicling and sharing the joys, struggles, and triumphs of the people of Mexico. While the musical form and instrumentation of mariachi vary regionally, the ensemble that is familiar today began to take shape in the 19th century in the state of Jalisco: the cocula or the vihuela (plucked-string instruments), two violins, and the guitarron (guitar). Skare began one-on-one mariachi guitarron instruction with Cardenas in 2012. Her passion for mariachi and her eagerness to learn more about it, inspired Cardenas to begin a guitar and music program for seniors at the United Community Senior Center on Milwaukee’s south side the following year. Developed with the help of UCC Senior Center director Hector Hernandez, the program teaches seniors how to read sheet music and play scales and chords. And, as Cardenas points out, it also gives many a sense of community and a larger purpose. “[These seniors] all have knowledge, experiences, and emotions that they want to express through some artistic endeavor, be it music, singing, [or] poetry. They just need opportunities opened to them,” says Cardenas. In the first year of the program, fifteen seniors on guitar and three singers from a variety of Spanish-speaking countries selected songs that Cardenas then arranged. The group rehearsed at least two hours a week at the UCC Senior Center. By 2014, Skare had become so advanced in her one-on-one guitar work, that Cardenas made her an assistant program instructor. 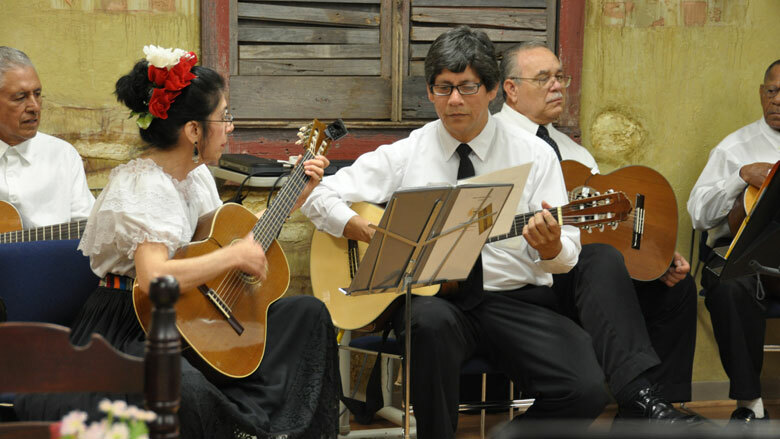 That same year, the two received a Folk Arts Apprenticeship grant from the Wisconsin Arts Board to more deeply explore different strumming patterns for such traditional mariachi styles as baladas (ballads), corridos (narrative songs), rancheras (folk music reflecting upon the Mexican Revolution), and many other distinct mariachi genres. The two also worked to expand the musical repertoire of the senior group—now called Grupo Renacer (renacer means rebirth in Spanish)—to include other styles from Mexico, Central and South America, and the Caribbean. Today Grupo Renacer can be found playing shows at the UCC and Los Mariachis Restaurant, as well as other venues around Milwaukee. Recently, a nonprofit dedicated to providing imaginative and provocative music experiences called Present Music commissioned Groupo Renancer to create a new piece for ComposeMilwaukee, a citywide initiative to cultivate musical composition. Grupo Renacer performed this new piece, along with some of their traditional pieces, at the recent Wisconsin Folks: Masters of Tradition concert at the Stoughton Opera House.